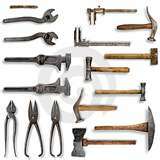 One of the most important aspects of doing any job well is to have the right tool for the job. The tool doesn’t always have to be of the utmost highest quality, but poor quality tools will hinder you for sure in several ways: speed, safety and results. This is especially true for good home cooking. I’ve learned this by cooking in foreign kitchens, despite frequently bringing my own chef’s knife and a specialty tool or so. Vacation homes, my mother-in-law’s kitchen, even my own mom’s kitchen (sorry Mom, you know I still love you) are all harder to cook in due to the differences in a few key kitchen tools. For example, my dear mother-in-law Eleanor had an inset glass cutting board in her 1970’s-built countertop. The glass surface was very difficult to cut on because a knife can’t “grip” into the cutting surface below the product. Picture the little slices that end up in a plastic or wood cutting board. Not only that, a knife could easily slip sideways. So all three areas I mentioned above held true: speed, safety and results were compromised. Single purpose tool – a cherry pitter that I used once, and for the past decade have been unable to find the one time a year I need it. Many cook books contain lists of what you must or should have in your kitchen. I’m resisting that temptation. Instead, here are my 10 Most Important Cooking Tools. You should have each of these tools on hand, and each should be of pretty darn good quality. If you can’t have them all at first (for example, as with my nephew Peter who is restocking a kitchen after being in the Marines), then this should be an important checklist for you. Dutch Oven – hey, the glasses don’t REALLY count as a pick, do they? I’m sure serious and non-serious cooks could debate this list extensively over martinis or Chardonnay. The logic behind this list is that when these items are poor quality, like the ones in the beach house in South Carolina we’ll be visiting again this summer, the cooking gets quite a bit slower and harder. You can count on me bringing more kitchen equipment than last year, much of it on “the list”. Also, this is a good starting point for a beginner, especially to focus on high quality versions of each of these tools. Oh - one more thing. Even in the case of simple utentsils like wooden spoons, spatulas and turners, paying a few bucks more upfront for a high quality tool will mean you may never have to replace a cheaper version. AKA "Chicken a la Jennifer"
Here's a modified version of a recipe from Bon Appetit that I've improved upon. The original recipe called for a very small amount of chicken and a massive amount of gorgonzola. Cook pasta while sauteeing the chicken and making the sauce. Reserve 1/2 cup cooking liquid if pasta is done before the sauce has been completed. Slice prosciutto or pancetta in thin strips. Add to skillet over medium-high heat with a tiny drizzle of olive oil. Saute until crispy. Remove and drain on paper towels. Salt and pepper the chicken breasts, then saute in olive oil, about 3 minutes per side, 4 minutes if very thick. Remove and cover with foil. Add 1 tablespoon oil to pan, add the shallot, garlic and sun dried tomato slices. Saute for 2 min. Add the stock or wine and bring to a boil. Add 1/4 cup gorgonzola and simmer until it melts. Turn heat to lowest setting. Slice the chicken pieces and add them to sauce along with any juices that escaped from the sliced chicken. Add basil or other herbs. If pasta is a little dry, add some reserved cooking liquid first. Add sauce to pasta. Top with prosciutto / pancetta and grated Parmigiano Reggiano. Season with S&P to taste. Prep prosciutto or pancetta, and saute. Saute other items and complete sauce. At some point while chicken or other items are cooking, pasta will be done. Reserve some cooking water and drain. My friend Tim made a chicken and pasta dish for his family last week, and despite high ratings from reviewers on epicurious.com, he thought it turned out poorly. In fact, his wife Jennifer disliked it so much she wouldn't eat it. So Tim turned to me for a little advice. I told him he has too many swing thoughts before he hits his drives, and he ought to take more time to line up his putts. But that wasn't the kind of advice he was looking for. The reason Jen didn't like the dish was the overpowering amount of Gorgonzola it contained. He also wasn't pleased with the color, which came from using the oil from jarred sun-dried tomatoes. I took a look at the recipe he used (you can link to it here: Pasta with Chicken, Sun-Dried Tomatoes and Gorgonzola Sauce) and saw a few things I'd do differently. There indeed was a LOT of Gorgonzola in the sauce, especially since the recipe called for only 9 oz. of boneless chicken breasts. Besides the cheese, the recipe is at the mercy of the oil in the sun-dried tomatoes. Some are tasty, some are average, but you have somewhat lost control of the tastes depending on which brand you happened to buy. By using sun dried tomatoes sold in the dried fruit/nut section of the grocery store, you'll get a little more texture (many jarred SD tomatoes are mushy) and you can control the flavors. Cooking prosciutto slices in a sauce is a waste. LIttle or not flavor will come through. However, frying them up to a crispy texture first will turn them into a nice topping at the end. Pancetta works the same way and is a little easier and less expensive to work with. AND by sauteing the chicken in the same pan as the prosciutto / pancetta, you carry some of that flavor over to the chicken. The recipe doesn't mention adding salt and pepper to the chicken breasts before cooking. This is an important step to bring out flavors from a pretty bland protein. Also, letting the chicken warm up at room temperature while you are slicing the other ingredients will allow it to cook better than if it's very cold straight from the fridge. Garlic is fine as an aromatic base, but a little shallot (or regular onion) and garlic are even better. I LOVE fresh herbs, but I think 1/2 cup of basil is a little much. Not a big deal, just my taste. To put my money where my mouth is (or should I say put my mouth where my mouth is? ), I made my revised version of the dish last week. Frankly, I think Jen would eat it with the changes I made. In fact, Tim and I are playing a golf tournament this weekend, and are having a family dinner Saturday night. This dish will be on the menu for sure. You might read this and think, "Who cares, Tom. So, you revised a recipe to suit it to your taste." True, but I think there is a key differences in what I recommend. I think my version provides a fresher, better balanced profile of flavors. And what family of four would really be satisfied with just over half a pound of chicken mixed into one pound of pasta. I'm not recommending big portions and overeating, but that ratio is just poor. Tim's story reinforces one of the most important principles I use to cook well: beware of random searches for recipes online. Just because the ingredients sound like a great combination doesn't mean that the recipe is well composed. 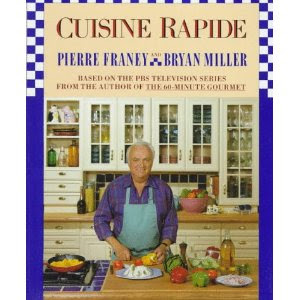 I recollect similar recipes as this one from my favorite old cookbook, Cuisine Rapide by Pierre Franey which are well composed, and use similar ingredients and techniques. You might want to check out that book sometime. It's out of print, but copies are still available via amazon. This version of marinated olives takes a bit more work than the Orange-Fennel version I just shared. But people will love the sweet and tangy flavors combined with salty olives. 2 garlic cloves, crushed and sliced (maybe I was in a destructive mood when i created this recipe, what with all this crushing going on). Heat vinegar, sugar and shallot until reduced to about 1 tablespoon of liquid. Combine all ingredients up to garlic and oil. Heat garlic in oil for 30-45 seconds, until it just begins to color. Immediately pour garlic and oil over olives and mix thoroughly. This is a simple recipe to put together, but is definitely better if you can let it marinate for at least a day. The olives will keep for about a week refrigerated. Gently rinse the olives under cool water. This allows you to better control the flavors, rather than the taste of what the producer used to brine the olives. Toast fennel seeds in a small skillet over medium heat. As soon as you can smell the seeds, remove them from the heat. Gently crush the fennel seeds. Smash and slice the garlic clove. Grate the orange zest with a zester or microplane grater. If you don't have such a grater, use a peeler to take a 1 inch by 3 inch peel off the orange, then cut away the white pith on the back of the peel using a sharp knife. Then slice the peel into the thinnest strips you can create. Combine all the ingredients, and add a turn or two of fresh ground black pepper. In late January and early February I shared with the readers of this newsletter that I auditioned for a new reality TV show for home cooks. It's call Master Chef and scheduled to appear on Fox this summer, with Gordon Ramsey as the star. The idea is that you can have no professional culinary background in order to be on the show. Well, after test cooking, on-camera interviews, 52 pages of forms and background checks, and an hour long home video, when all was done.......I came close. Apparently, based on comments made by the casting director, I was one of the very last people cut before the final selection. I don't know how many people will be on the show, but usually these shows start with 12-16 people. So out of over 5000 contestants, I'm pretty proud of how far I got. On the other hand, I don't know what my gut is going to feel like when the show finally airs. It might be hard to watch. But one consolation, and this will hardly surprise you, they were far less interested in cooking skill than they were "the rest of your story". Since I have a few interesting stories to tell, and our family situation is somewhat unique in some ways, I HAD stories. Just not enough. Sounds a little vague, doesn't it? Well, I DID cook authentic Sichuan Chinese dishes both for the audition and on camera. And I DID explain the 9 course meal I made for high school homecoming last fall. The menu appeared to be kids food, but each dish was actually a high-end gourmet preparation (frozen red vinegar vinaigrette, anyone?). All in all it was a great experience that made me look at myself, my cooking and my dreams in a way I had never done before. Plus I spent a couple nights in New Orleans eating in great restaurants. I also became a fan of Gordon Ramsey. I mean, if I was going to cook for the guy's show, I'd better know more about him. His TV reputation in the US is far from his reality. I recommend his book A Chef for All Seasons. The recipes and presentations are a little advanced, but they are fresh and bold. In paperback it's not much of an investment, either. Lately I've had quite a taste for simple, spring flavors. We've spent a good bit of time outside on our patio before it gets too warm and buggy in Houston to do that much more. Pleasant appetizers we've tried are a turkey and ham pate with Cointreau, and homemade Fromage Blanc cheese, each on homemade herbed flatbreads. But those dishes are pretty complex and time consuming to make. (Drop me a note if you want me to share the recipes, though). So in the spirit of cocktails on the patio, this week I present a recipe for flavored olives. Try to get high quality fresh or jarred brine cured olives. Working them up with your own flavors will be far superior to the flavors from the ubiquitous olive bars in the supermarkets. I'm sure you'll be pleased. This topping is great for steak, chicken, or even a simple bruschetta! My personal favorite is on top of an Italian braised veal shank. Mmm! Combine the first four ingredients in a food processor and pulse until finely chopped. Add the olive oil and salt and pepper to taste, then pulse several times again. Yep. That's all. Roasted garlic is SO easy to make. It can be used alone as a topping for bruschetta, pizza or grilled vegetables. As an ingredient buried in a complex dish, it adds an earthly sweetness, not the bite of raw or lightly cooked garlic. Take the whole bulb of garlic and chop the top part completely off about 1/4" from the top, exposing the cloves. If you aren't sure which part is the top...it's the skinnier end of the bulb. Set the bulb in an oven safe dish lined with aluminum foil. Drizzle with a generous amount of olive oil - about 2 tablespoons. Liberally salt and pepper it and pop it in a 400 degree oven for about 45 minutes or until you see a deep caramelized color. The cloves will just pop right out of the skin and you can then smash it all together and add it to your favorite pasta sauce or simply spread on some crostini! A little bit trickier way to play with garlic, but worth it! 1. Take one clove of garlic, skin off, and this time do not smash it when peeling. 2. Slice the clove as thinly as possible, making each slice close the same thichness as the others. 3. Add 1/4 cup olive oil to a small shallow pan,over medium high heat. 4. Add the garlic slices and fry until they just turn golden brown. This is the tricky part: be careful not to burn them. Once perfectly brown and crispy, remove from the oil and set on a paper towel to dry. The chips can be used to garnish anything from soup to potatoes and is just a fun way to work with the ingredient. Garlic: Not Just for Warding Off Vampires! 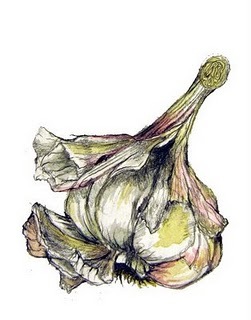 This week we hear again from Rebecca VanDolzer, with her thoughts on Garlic. Thanks for contributing again, Becca. Garlic is found in almost every cuisine imaginable. It can be linked culturally or horticulturally to every single country somehow, someway. It is consumed, produced, and used all over the world. The main purpose for garlic is culinary, although it has many added benefits along with that yummy taste. Garlic can fight the common cold, prevent heart disease and keep pesky vampires at bay. Beware though, after consuming garlic you might ward off more than just the vampires. It doesn't exactly help with fresh breath so you might want to avoid it before an important interview or date! I never really minded the smell of garlic though, I guess it's the Italian in me! Heidi Klum even swears by the stuff. She claims to eat at least a clove of garlic every day, raw or prepared in food, to keep her looks and health in tip top shape. Now, I don't know about you, but if Heidi Klum looks like that from garlic.... then count me in! OK, all of that aside, I find garlic to be a necessary addition in most all of my recipes. It is a main aromaic flavor for almost all the sauces, soups, and toppings in my repertoire. I absolutely love the stuff! I have to say that there are some ways to prepare garlic that are better and easier than others, so I'll share a few ways with you now. Prepping: I never use less than 4 large cloves (told you I love the stuff!) Take the individual cloves of garlic, with the flat side of your knife pound the clove as if you are banging down the gavel in a court room. This will do most of the work for you in removing the skin. It should peel right off! Once you have thrown it away you can then begin to mince the garlic, either by knife or food processor. Minced Garlic: The workhorse of the kitchen, simple minced garlic is great for sauteing to start (or finish) a dish, or raw to become a topping like Gremolata! Roasted Garlic: Doesn't need much else, it can actually be used as a topping of its own. Orange Rosemary Gremolata - a mixture of fresh herbs, garlic, oranze zest and oilive oil. Fried Garlic Chips - Very thin garlic slices fried until crispy brown. They'll tast salty even thouhg no salt has been added. Detail reicpes for each of these dishes follow below. I hope you have gained some knowledge about garlic from this and cannot wait to try it at home!